I used to access StackOverflow with Google Chrome but unfortunately today I am trying to login from IE 6.0.2 but when Click on "Login" link I am redirected to "Login page" but there is no "username" or "password" textbox to enter, and IE hangs out for endless time. I just want to know if support for IE 6.0.2 is dropped by StackOverflow ? There is no such problem in Chrome. Stack Exchange supports Internet Explorer 10 and above. Anything below is not supported. No site should be supporting IE6 anymore in my opinion anyway. Change your browser (or if you can't, may God have mercy upon thy soul). Not the answer you're looking for? Browse other questions tagged support login internet-explorer . 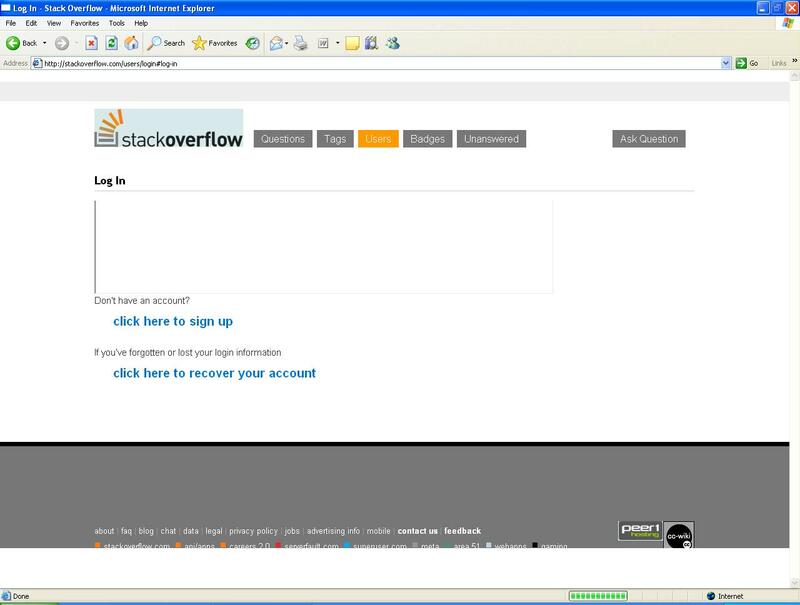 Can I Login to Stackoverflow using RoboForm (Password Manager)? is there a way to log on and save the account/password (stay logged on)? Forgot email I signed up with! How can I login with username? How to use different logins for the same account?